The West Point Tuba Quartet will be performing at Sam Houston State University in the Fine Arts Building Room 202 on Thursday (Feb. 27) at 7:30 p.m. The quartet is one of several chamber ensembles comprising members of the United States Military Academy Band at West Point, N.Y. The quartet was formed in April 1988 to expand public awareness of the solo capacity and flexibility of low brass instruments, and performing the ever-expanding repertoire of tuba ensemble music. With music ranging from Renaissance madrigals to ragtime tunes, from marches to original tuba compositions, the quartet has entertained and delighted audiences with the lush, harmonious sounds emanating from these instruments. The Woodstock Times called the group, "An ensemble... virtuosic in line and tone." The quartet has performed at such prestigious events as the U.S. Army Band's Tuba-Euphonium Conference at Ft. Meyer, Va in. 1989 and 1994, and at the Eastern National T.U.B.A. Conference in Washington, D.C. in 1989. Each musician of the quartet had a rich and varied background of performance and academic experience prior to his selection, through personal audition, for duty with the famed U.S. Military Academy Band. Each member of the ensemble serves as active-duty Army bandsman with the Military Academy Concert and Marching Bands. MASTER SERGEANT JOSEPH ROCCARO - TUBA: MSG Roccaro, a native of Easton, Pa., has been a member of the U.S. Military Academy Band since May 1981. He serves as principal tubist in the concert band and as the band's tuba section leader. 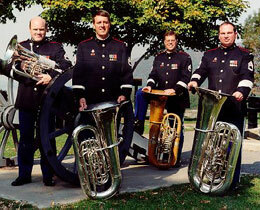 He is a member of the West Point Tuba Quartet and the Highlands Brass Quintet. MSG Roccaro is a graduate of the Juilliard School of Music, where he earned both his bachelor of music and master of music degrees. SERGEANT FIRST CLASS THOMAS PRICE - TUBA: SFC Price began his duties with the U.S. Military Academy Band in October 1986. Originally from Austin, SFC Price attended Southwest Texas State University, where he received his bachelor of music education degree. He earned his master of music degree from the University of Kansas. SFC Price has been a guest soloist and clinician for the United States Army Band's "Pershing's Own." SFC Price is also a member of the Heritage Brass Quintet. SERGEANT FIRST CLASS GERALD CATES - TUBA: SFC Cates has been a member of the U.S. Military Academy Band since June 1989. He received a bachelor's degree from Tennessee Technological University in 1985, and a master's degree from the University of Illinois in 1986. Prior to joining the band, SFC Cates was the director of bands for the Marshall County Public Schools in Lewisburg, Tenn. In addition to being in the Tuba Quartet, SFC Cates is a member of the Regimental Brass Quintet. STAFF SERGEANT BARRY MORRISON - EUPHONIUM: Joining the U.S. Military Academy Band in April 1987, SSG Morrison hails from Montgomery, Ala. He holds a bachelor of science degree in music education from the University of Alabama, and a master of music degree from East Texas State University. Prior to joining the band, SSG Morrison taught in the public schools of Alabama and Texas. When not performing his Army duties, he serves as conductor of the Southern Dutchess Pops Orchestra and the Rhinebeck Legion Band.